The terms “fiscal prudence” and “fiscal consolidation” appear frequently in the Survey tabled on Friday. What do they mean? To put in plain words, the government has identified subsidies—oil, food and fertiliser—as the most important sector that must now be “rationalised” to unleash the economic potential of the country. The Survey has been unequivocal in pushing for cash transfer in place of distribution of food grains through the public distribution system. Though monetisation has been in the pipeline, including for food grains, this is probably the first time that the government has given definite indications in favour of rolling this out. At the same time, the Survey has pointed to a sharp decline in rural wages, declining rate of employment and also, a declining rate of agricultural growth. But interestingly, all three worrying facts have been manipulated to argue that subsidies have not reached or are not reaching the people. Thus, they must be rationalised or done away with. The deep decline in rural wage rate has been articulated as a sign of recovery of the economy. Wage growth has declined from over 20 per cent to about 3.6 per cent. If these trends continue, rural wage growth will continue to decelerate, further moderating inflationary pressures. A deeper shift in agriculture may be under way which calls for greater attention to this sector. The decade-long shift in terms of trade towards agriculture may have come to an end as global agricultural prices have peaked. Studies show a slow decline after 2010-11, following several years of improvement. One response in the short run must be to enhance targeted support for the vulnerable in agriculture, namely the small farmer and agricultural labourer. 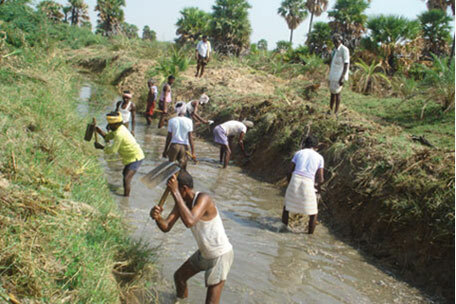 The MGNREGA programme has the virtue of being reasonably well-targeted. The challenge here is to build on this feature and use the programme to build assets such as rural roads, micro-irrigation and water management, while shoring up rural incomes. Rationalisation of subsidies and better targeting of beneficiaries through direct transfers would generate part of the resources for public investment which is essential in research, education, extension, irrigation, water-management, soil-testing, warehousing and cold storage. Distortions emerging from various policies, including exempting user charges for electricity and water, need to be reduced through better targeting and elimination of leakages. The recommendations of the Shanta Kumar Committee provide useful suggestions for the future road-map of the food policy. The functioning of the Food Corporation of India needs to be revamped substantially. Every effort should be made to bring states on board to create a national common market for agricultural commodities. In a market economy, prices play a key role in allocating scarce resources to different agents. Subsidies can distort the incentives of consumers and producers and result in misallocation of resources across sectors and firms. This lowers aggregate productivity and often, disproportionately hurts the poor and vulnerable. Converting all subsidies into direct benefit transfers is, therefore, a laudable goal of government policy. But developing the states’ capacity to implement the direct transfers will take time.